It's common to worry if your youngster is feeling down in the dumps because of a headache. But in most cases, a headache on its own is rarely cause for alarm. However, if the headache is accompanied by nausea -- or other symptoms -- it could be a sign of a more serious condition. 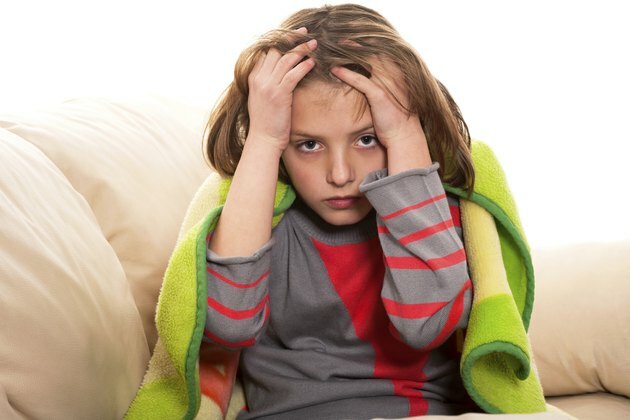 KidsHealth.org recommends contacting your family physician or pediatrician if your child has both symptoms of nausea and headache simultaneously. Tension-type headaches due to stress could be the cause for your child's symptoms. These headaches are the result of muscle contractions, and they affect 15 to 20 percent of adolescents and to a smaller extent, children, explains the Cleveland Clinic. Although not every tension-type headache is accompanied by nausea, some children exhibit these signs. The Clinic advises having your child see a doctor for headaches and nausea combined. Another potential cause for headaches with nausea is migraines. This can be uncomfortable for your child, causing severe pain. According to KidsHealth.org, one out of every 20 children experience migraines. Other symptoms to look for are sensitivity to sound, lights and smells. Migraines can go away after a good night's sleep, but seek a doctor's opinion if you suspect migraines are the reason for your little one's discomfort. Concussions in children can be anywhere from mild to severe. It's not unusual for a concussion to go unnoticed, points out KidsHealth.org, especially if the symptoms don't show up immediately after the injury. Headache with nausea and vomiting are signs of concussion and require immediate medical attention. Other symptoms may include difficulties in thinking, dizziness, confusion and blurred vision. If your child complains of a headache and feels like throwing up, check to see if other symptoms are present. Meningitis is an inflammation of the brain, usually caused by a virus. Other signs include a sudden fever, stiff neck and seizures. These may come on quickly or take one or two days to develop. Meningitis is a serious infection that can be life-threatening and requires immediate medical attention.